Manipur Chief Minister, N Biren Singh at the Orange Festival In Tamenglong on Saturday. Photo: DIPR, Manipur. 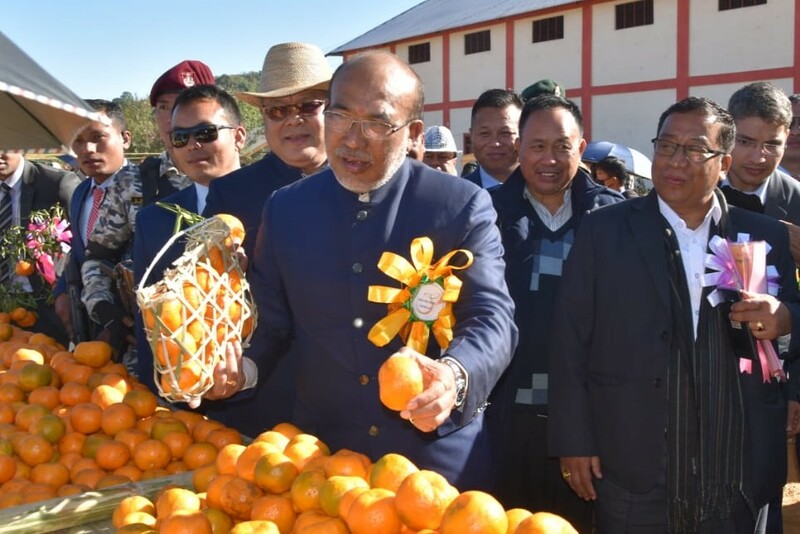 Manipur Chief Minister Nongthombam Biren Singh today inaugurated the 15th the State Level Orange Festival at Tamenglong district headquarters, around 150 km west of the state’s capital Imphal with a promise financial help for orange growers of the district. This year’s Orange Festival will be marked by a series of programmes including the Orange queen 2018, a beauty contest and the main crowd puller of the festival. A seminar on orange production and its main issues, has been scheduled for the three-day festival. Addressing the colourful opening session at the Tamenglong local ground, Chief Minister Biren said the state government would provide financial help under the start-up programme to the orange growers in Tamenglong through the Deputy Commissioner office and directed the concerned officials to set up a research team within a week to look into the problems faced by the orange growers of Tamenglong. Horticulture and Soil Conservation Minister Th Shyamkumar, Consumers affairs and food and public distribution Minister, Karam Shyam, MLAs Samuel Jendai(Tamenglong), Awangbou Newmai(Tamei) attended the opening ceremony. Altogether 173 orange growers are participating this year’s orange festival which is held annually to promote tourism and provide an opportunity to orange farmers to display their produce before potential buyers. Besides, it offers an opportunity to both orange growers and fruit-processing industries to clinch deals. In the day’s inaugural function, Chief Minister Biren launched a news websitewww.dihcham.com-a popular rongmei dialect newspaper in Tamenglong. Tamenglong, the orange belt of the state produces more than 60 per cent of the State’s total production, is the roosting place of popular migratory bird Amur Falcon. It may be mentioned that Manipur has been organising orange festival in Tamenglong, kiwi festival in Senapati, Lemon festival in Ukhrul, pineapples festival in Imphal East and Churachandpur, ginger festival in Pherzawl district, flower and cherry blossom festival at Mao in Senapati, Shirui festival at Shiuri village in Ukhrul district .